If you’ve ever descended into the deep well of professional wrestling, you’ll know Mexico has produced a scene unlike any other. South of the border, lucha libre is more than an oily entertainment form - it’s a mystical fiction full of real-life superheroes and villains who do battle every week in the ‘squared circle’. From the unforgettable names to the iconic masks, luchadors - the name given to Mexican masked wrestlers - have become a symbol of ‘rasslin at its most quintessentially theatric. But what happens when you take one of those muscled heroes and fling them into a magical platforming adventure where your signature moves and finishers are all that stand between you and an army of the undead? 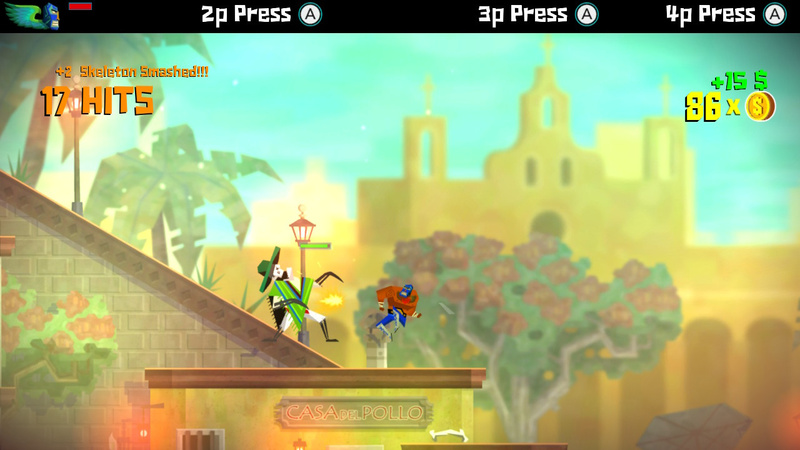 Yes, it’s as ridiculous as it sounds, but that’s what makes Guacamelee! Super Turbo Championship Edition such a bizarre yet brilliant experience. One that fully embraces the many strands of Mexican culture - the cheesy melodrama of its soap operas, the reverence for death found in Día de Muertos (‘Day of the Dead’ if you were wondering) and, of course, the theatre of wrestling - and weaves them into one colourful adventure. Boiled down to its simplest ingredients, Guacamelee! is part Metroidvania platformer, part brawler. You’ll explore all manner of locations from quaint villages to the depths of the underworld - and, as you might expect, there are plenty of secrets to uncover should you wish to backtrack at a later date with new skills and abilities you didn’t have before - but it’s the combat that really makes it stand apart from its contemporaries. Juan Aguacate, the masked hero of our story, will be relying on his fists and his knowledge of Wrestling 101 to pummel, slam and suplex his foes into a one-two-three finish. Even after five years, it’s still a slick and rewarding combat model that looks great - that colourful, cartoonish 2D look really pops in both handheld and docked modes - and there’s so much room for you to mix up how you apply these abilities. For instance, a rising punch is a great way to knock an enemy clear, but it’s also a nifty way to extend the extent of your jump. You soon begin to appreciate how hard developer Drinkbox worked to create a synergy between platforming and combat mechanics. If you played the original version of the game released in 2013 and didn’t try out this enhanced version, then there’s plenty of reasons to revisit it. Rather than just chucking on a new title and slapping on a higher price tag, this updated edition benefits from brand new areas to explore, as well as all the DLC content the game received post-launch. But it’s more than just extra stuff to do - you’re getting the most optimised iteration yet, with all the small yet significant changes that make Guacamelee! that bit more exciting to play. Something as insignificant as adding health bars for every enemy gives you just enough extra data to inform how you apply every flying slam or lariat. The support for local co-op multiplayer - where up to four players can take on the story mode together - makes this a perfect fit for some split Joy-Con action, but it’s still just as slick and rewarding when played solo. It runs smooth as silk on Nintendo Switch, with nary a drop in frames or a loading screen that overstays its welcome. The HD Rumble support really makes a difference to all that brawling action and makes it instantly superior to the previous iterations on Wii U and PS Vita. 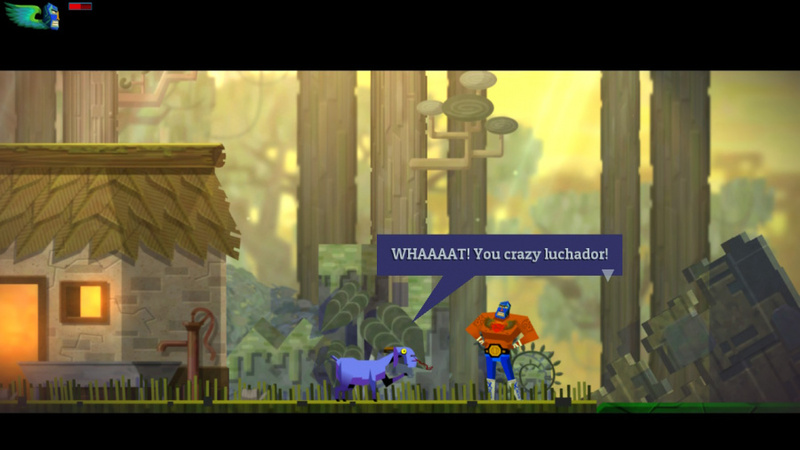 Over four years on and Guacamelee! Super Turbo Championship Edition is still a ‘rasslin riot that’s well worth a play. Despite the passage of time, this colourful indie effort doesn’t show its age and fits the portability of Switch down to the ground. 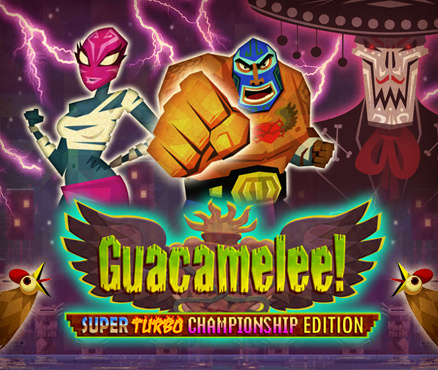 If you’ve played it already on Wii U there’s very little here to convince you to double dip (unless, of course, you’ve only played the 2013 version) - bar the ability to play in handheld mode - but if you’ve somehow missed this lovely luchador adventure, you’ll struggle to find a better platform to play it on. I'm thrilled that this happened, having only recently discovered the joy of Guacamelee that was sitting in my Steam backlog for many a year, some acquisition in a humble bundle of years back I think. This is one that along with the sequel, I would adore to get physical for the Switch. They're so damned fun. Glad it made the transition well. Cant wait for the 2nd game! I was going to double-dip but Mark of the Ninja: Remastered got released the following day. Besides, I still have my Wii U hooked up. Yes it's an indie, and yes it's a port. Doesn't change that it's one of the most stylish, fun, and hilarious metroidvanias ever made. If you haven't played it yet, please do and enjoy! It's hard not to have a good time with this one. And a buttery smooth 60fps too. A solid port of a solid game. Much like Child of Light, I need to go back and play this. I have my WiiU still hooked up though so I'll pass. Remember you get 30% 0ff the sequel if you buy this game. I'm probably not double dipping because I own it on Wii U and Xbox One. Just downloaded yesterday and never played it before..I love it.. If ever an indie was deserving of a 9/10 it's this one. Love this game's soundtrack! I could easily see myself triple dipping into my wallet for this. That's my style of game but for some reason I've never played it. Time to make this wrong right! @OorWullie I agree, they gave Gone Home and Flipping Death, both mediocre games, a higher score than this indie masterpiece. The reviews on this site are an absolute joke. What a great game! Play it with someone, guys, and you'll have an awesome time. I'll get this after I'm finished with Mark of the Ninja. I may get Child of Light too, which I got on Wii U but never finished. This was free for Playstation Plus members like 3 years ago - I can dig it out, so pass for me. @OorWullie What does being an indie have to do with it? @Yasume Agreed. I never bothered with Flipping Death as I really disliked Stick it to the Man, I did play Gone Home though on the strength of Dom's review and I really wish I never. That game was that bad it actually put me in a bad mood. There just isn't any consistency with NL's scores anymore. It never used to be like this,for the most past their scores aligned with my own. @Dr_Corndog I should have said 'indie game' but I think it's pretty obvious what I meant. For that reason I won't bother editing it. Anyone know if it will get a physical? @OorWullie OK, so in that case, what does it being an indie game have to do with it? @Frendo I agree that it's a shame, especially since indies like Guacamelee!, Celeste, Hollow Knight, and Hyper Light Drifter are (IMO) better than a good majority of AAA games. Hollow Knight alone has so much more content at a higher quality than many big-name games as well...not to mention it's a quarter of AAA retail price. I just hope that in the future we can judge games based on their quality, rather than the size of their budgets or publishers. @Dr_Corndog Because many people stupidly treat indies as lesser games? That doesn't mean he does. No need to make up a reason to argue over nothing. It's quite obvious all he is saying is he thinks this game deserves a 9. @Frendo @ilikeike Agreed. If I had to guess, I spend far more time playing indie titles than I do AAA. I love all types of games, it's just there are so many great indie developers out there. It's pretty much Nintendo + Indies for me, with the occasional AAA PC release. Very close to finishing Hollow Knight...then The Messenger came out. Close to finishing Messenger...now Guacamelee comes out. I am loving the Lucha style of this whole thing mixed with easter eggs and humor. It's a really fun experience. FYI all three games are great in their own, different way. I just want to remind this game has a LOT of Nintendo related Easter eggs, every Nintendo fan should play it for this very reason. Lovely. In fact this amazed me when this game was a Vita exclusive. I loved this but having never played the 2nd and since I've been informed that no.2 is a "more of the same" deal I really don't see the point in replaying 1 again before getting 2. I totally recommend anyone interested to give this a shot though. I got this on PS4 a year back for $5 and loved it. Highly recommend. I was waiting for a sale on the sequel, but I think I'll opt to get it on Switch instead. @roadrunner343 Not arguing. I was genuinely curious, and I never got an answer. @Dr_Corndog Did not mean to imply you were arguing (yet), only that I think it's a bit pointless to nitpick over using the word "indie" to describe an indie game and risk starting an argument, when I think it's obvious he is simply saying he believes the game to deserve a higher score, and it also happens to be an indie game. Had it on Vita. This game falls for me in the same category like Dead Cells, Child of Light, Hyperlight Drifter or Hollow Knight. I don't know why, but there comes a point where I don't have fun while playing these titles. First I'm loving playing them, but sooner or later it's over. Axiom Verge, Ghost 1.0, The Messenger, Cave Story or Xeodrifter, which are all more or less in the same genre, are one of the best games I've ever played in my life, but Guacamelee.... can't say why. It just bores me at some point. Played this a bit on my WiiU; loved it to bits. Definitely getting this and its sequel for my Switch. @Jack_Goetz how was Ninja? It looks fun. This game has awesome music and is really fun! Awesome that they surprised us with this release! Love it on the PS Vita, but I could not get pass one section off the game. Always mean to get back to it. Depending on price, I think I will purchase for the switch and try again. This game just jumped Pro Wrestling to become the best wrestling game on Switch, and it’s not even a wrestling game. Saving my pesos for the sequel, but if you haven’t played; man oh man is it great. @Rohanrocks88 I seen it on Cheapassgamer. I guess it's on the eshop. I enjoyed this game but never felt any desire to replay it. I also found it too linear to really be considered a metroidvania. Definitely recommended to anyone who's never played it though. The combat is a lot of fun. Absolutely love this game. Bought the originaland on PS3 and Vita. Then I bought this version on Wii U. I'm going to triple dip on this one and get it again on Switch. It's just that good of a game. @Spoony_Tech Is there any trailer on it yet? I wonder what's the story? @Reigestugatensho I do know that Juan got really thin and that ties into the story somehow. I saw a review a while back and he seemed to like it more then the first game. I didn’t like it when I played it on Wii U. The art style and world are totally bland and uninteresting. The characters seem to chatter on and on during story segments, and it isn’t that gripping. Level design was low-key Metroid, and the combat never truly explanded beyond the basic combo of popping enemies up, following them, and slamming. @Spoony_Tech Thanks for the info! I gotta do some research to find out more. I can't wait to play Guacamelee 2 it received great reviews from all the reviews I've read, most said 2 is the slightly better of the two which is a great thing as Guacamelee 1 is such a fantastic fun game. I love the throw backs to Super Metroid. It would be so awesome if they would do a physical with both titles . 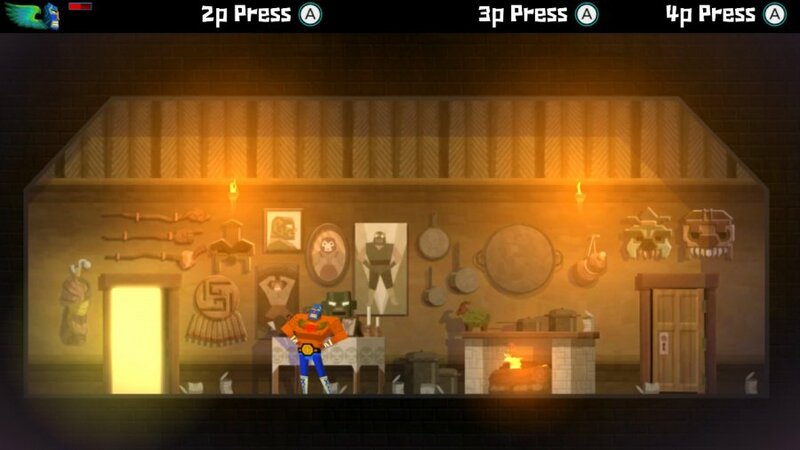 For anyone who is on the fence I highly recommend getting Guacamelee you won't be let down it is such a great title with fantastic graphics, solid play control, a great theme and the co-op play is spectacular. A true gem in every way. I have too many unplayed metroidvanias to double dip on the ones I already played through on Steam. Though Guacamelee is a slightly different beast just because it has co-op, whereas most Metroidvanias are solo experiences. Still, I've yet to even get close to finishing Hollow Knight. @roadrunner343 If you say so. I still don't know for sure what he meant, and I guess I never will. Not that it really matters. FWIW, I'd say this game is worth AT LEAST a 9, indie or no. @0rwellianson It's really good, though I'd wait for a possible patch as the frame rate is quite iffy. I found this game to be quite fun for a while, but that last boss was a nightmare. I wouldn't double dip but it's a neat game. I'm planning to get the sequel. @Jack_Goetz thanks for the tip. Will do. @Dr_Corndog I think the answer you are looking for is: go and read the comments on the Child of Light review. There's a big whinge there about "I'm sick of indies, NL should give them all 5s" and @OorWullie was hoping to shut it down here before it started. Can you play this game with single joy cons?